These are creatures that are said to turn from humans into wolves. The plant wolfsbane (monkshood) and shooting the animal with blessed silver bullets, were said to be a deterrent for these creatures. Residents of Hull have reported several sightings of a mystery "werewolf" which has terrified locals and sparked a hunt for the creature. Reports suggest the 8ft "beast" is half-man-half-creature, lurks around industrial estates and has allegedly been spotted eating a dog . Some believe it is an old folklore legend called Old Stinker - a wolf that transforms into a man at the full moon. Old Stinker is traditionally known to wander the Yorkshire Wolds. The new sightings of the mystery being were reported at an old water channel called the Barmston Drain during Christmas. Who claimed: "It was stood upright one moment. The next it was down on all fours running like a dog. I was terrified. "It bounded along on all fours, then stopped and reared up on to its back legs, before running down the embankment towards the water. "It vaulted 30ft over to the other side and vanished up the embankment and over a wall into some allotments." Another couple saw "something tall and hairy" eating a German Shepherd dog by the side of the drain. They stopped to get a closer look and saw it jump an 8ft fence, before vanishing into the night, still clutching its prey in its jaws. Another woman was walking her dog along the drain when she saw something "half-man, half-dog" in the distance. She was terrified, and her dog began shaking and refused to go any further along the path. Cllr Steve Wilson said: "I am happy to keep a diary of sightings by people around here and report them to Hull Council." Hollywood has helped to add a few characteristics of its own to the legend of the werewolf. Many werewolf films suggest that a full new moon is the trigger for a person to change into the wolf. There is also the suggestion that a werewolf bite may turn someone into a werewolf. Indeed there is a rare but well recognised psychological condition called lycanthropy that could to some extent explain the phenomenon. Persons suffering from this disorder often believe that they actually can turn into a wolf. They are often reported behaving in a wolf-like manner by howling at the moon or attacking people using their teeth and fingernails. This particular disorder, although rare is occasionally still reported in Europe. There is also a theory that in medieval times persons may have believed they could turn into wolves because of hallucinogenic drugs, derived from plants such as deadly nightshade and henbane. Ergot a grain-contaminating fungus, which secretes a compound similar to LSD, which promotes illusions and feelings of shape shifting, has also been offered up as a theory for the phenomena. As myth's greatest monsters are able to do, the werewolf legend has spread across borders, even across seas and oceans. Vicious animal attacks have been reported for centuries, yet during the day no one can find a trace of the creatures responsible. Those who study mythology have long known that few creatures have the power, speed, and mindless slaughtering propensity the way that werewolves do.Before we delve into the details of these fearsome and powerful creatures, it is important that we first clear up the confusion about what a "werewolf" actually is. - Persons who drank at a wolves watering hole. The history of the werewolf has roots in many different cultures, dating back to ancient times. One legend in particular refers to an early Native American tribe in the area that is now known as Wisconsin in the United States of America. It was here that members of thetribe may have been the first to receive the gift of the werewolf. In this legend, there is a spirit-god named Wisakachek (Native American Mythology). Wisakachek [pronounced 'Wee-ZA-Kah-Chek'], was a shape-shifter who lived in the woods. He was a friend to humans whose default physical form was that of a wolf. One day Wisakachek was roaming the woods in the form of a man when he saw two brothers from the Fox tribe hunting. The boys, named Keme and Matchitehew [pronounced 'Match-it-AYOO'], had just caught a deer with their bows and arrows. Wisakachek walked up to the boys and presented himself as a lost and hungry wanderer from a different tribe. Keme offered the "stranger" some of the deer meat that they had just caught, and Wisakachek accepted. About a week later, Wisakachek appeared in the same part of the woods again and saw the same boys again hunting. Matchitehew explained that ever since they caught the deer a week earlier they hadn't been able to catch anything and were very hungry. Wisakachek, remembering the boys' previous generosity, told them he had no meat to offer them, but he could share with them his power to shape-shift into a wolf so that they could catch a deer more easily. At first the boys didn't believe him, but when Wisakachek transformed into a wolf and back in front of their eyes, they excitedly agreed. The only condition that Wisakachek gave Keme and Matchitehew was that they could not use their wolf-forms to hurt any humans, only to hunt. These stories of the history of the werewolf were thought to be legends for many, many years, until a string of modern werewolf sightings beginning in 1936 changed everything. There is a bit of a disagreement among mythologists as to what really constitutes a werewolf. But when you break the information down, there seems to be three distinct creatures that are all known by this name. Fans of the Twilight series will recognize this type of "werewolf". Like the character Jacob Black and certain other members of the Quileute tribe, the shapeshifter wolf has the ability to change form at any time. The shape shifter wolves considered "werewolves" can only change from human to wolf form, though "pure" shape shifters can transform from human form to any other animal form, including a wolf. The shape shifter wolf can transform from human form to wolf form at will, though aggressive energy or anger may increase the likelihood of causing an unintentional transformation. It is believed that all shape shifters are born into this ability, and one cannot be transformed into a shape shifter by the bite from the creature. The Wolfman is often called a "werewolf" because in many legends this creature is believed to share many of the traits of the werewolf "curse". Many "werewolf" stories, including sightings of the legendary Bray Road Beast, describe a creature that is physically a combination of a wolf and a man. This mutant wolf-man typically has a mostly human-shaped body, stands on two legs, but is covered in wolf hair and has claws and fangs. Depending on the legend, some wolfmen are humans by day and wolf-men by night while others are in their duel human/wolf form at all times. I believe the generally accepted theory is that one begins by transforming from human to wolfman on full moons only, then over time it increases to every night, and eventually the body settles into a pure wolfman form at all times. The degree to which a wolfman can control his mind and emotions also degrades as these transformations become more permanent. A true "werewolf", according to most legends, is a human being that uncontrollably transforms into a wolf during a full moon. The original werewolf curse transformed a Shapeshifter Wolf into a Werewolf, effectively taking away the ability to control the shift but also taking away the ability to think as a human while in wolf form. Werewolves, when in wolf form, have uncontrollable rage and hunger. They are driven to kill everyone and everything they encounter, regardless of their relationship as humans. The curse causes these wolves to lose all control of their minds, and when they wake up in human form in the morning, they don't remember anything. 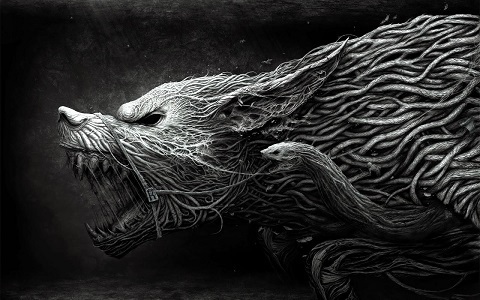 It is this form of werewolf that can transfer their condition through a bite, assuming of course that the human being bitten survives the attack. The term "human werewolf syndrome" refers to the condition wherein a werewolf, while in wolf form, maintains its human consciousness. Human Werewolf Syndrome is an extremely rare condition. It is a genetic abnormality caused by a mutation in the werewolf gene. This mutation occurs rarely and randomly in certain cases where two werewolves copulate to give birth to a werewolf child. the affected werewolf. This distortion causes the fur to be all black or all white, rather than the usual mix of browns, greys, and blacks of the common werewolf. Thus, black and white werewolves are able to maintain the same ability to think consciously and reasonably as a regular human being, no matter what form they take physically. The two variants of the species do differ significantly from one another though in that white werewolves never take human form, even from birth. Black werewolves still physically change at night just as a "normal" werewolf would, but they do not lose their ability to think with their human mind. Unlike vampires and zombies, werewolves can actually be born into their "condition". In order for this to happen though, the "werewolf gene" must be present in both parents. It's not as simple as you might think. Surprisingly, the werewolf gene is a recessive gene, meaning that when it is paired with the dominant human gene, it remains "inactive". This, of course, is a huge simplification of the entire genetic process, but it's all you really need to know to understand how to become a werewolf by birth. Everyone's chromosomes come in pairs. You get one chromosome from your father and one from your mother. The paired chromosome that you end up with is a combination of those two. Since your parents also have a pair of each chromosome, you will only get one of the two chromosomes that they carry. What this means is that your pair of chromosomes will be a random combination of one of the two chromosomes your father carries and one of the two chromosomes your mother carries. The chart below will hopefully shed some light on this explanation. • The "H" represents the dominant Human Gene, and the "w" represents the recessive Werewolf Gene. • F1 and F2 represent the two possible chromosomes from your father, and M1 and M2 represent the two possible chromosomes from your mother. • The combinations to the right of the single chromosomes show the four different possible genetic combinations for each set of chromosomes. • As you can see, there are nine distinct possible combinations that your mother and father together might have. • The "Chance" column shows the percentage of probability that the child would become a werewolf. As you can see from the chart, a combination of "HH" (Human/Human), "Hw" (Human/werewolf), or "wH" (werewolf/Human), all result in the same thing - a human child. This means that because the Human Gene is dominant over the Werewolf Gene, the resulting child will be born as a regular human. Only in the instances where the combination of chromosomes results in a "ww" (werewolf/werewolf) combination will the child be born a werewolf. Example:As you can tell from the chart above, most combinations of human and werewolf genes will result in a human child. That doesn't mean that the werewolf gene does not exist in that child. It certainly does. "Hw" and "wH" combinations may be dominated by the human gene, but the werewolf gene is still a part of the parent's genetic structure. Say a human marries a werewolf. Let's use Combo #7 for this. The father is full-on "ww" werewolf and the mother is full-on "HH" human. The resulting child will certainly be a "wH" human. From the outside, this child will seem like a normal human being, never transforming into a werewolf by the light of the moon. Let's go one step further. Say this child, our "wH", reproduces with another human with a recessive werewolf gene. Let's use Combo #5 for this (the order of the genes doesn't matter - "wH" is the same as "Hw"). Our child is the father, having "Hw", and the mother is the same, an "Hw". The resulting child of this pair has a 25% chance of being a werewolf. Before you figure out how to become a werewolf you should first make sure you know what you are getting yourself into. Modern popular fiction has confused the issue quite a bit by altering the definition of what a werewolf really is. What many people today think of as a "werewolf" is actually a "shape shifter". Some shape shifters turn exclusively into wolves from human form, but these are not actual werewolves. These shapeshifter-wolves have become popularly known as "werewolves" because of the Twilight book series. If it's this kind of creature you want to become, I'm afraid you are probably out of luck. Most shapeshifters are born that way genetically. You either have it or you don't, and most of us don't. A bite from a shapeshifter won't make you a shapeshifter, it will just be a bite. There is a single exception, though. Navajo mythology discusses a being known as a "Skinwalker", who in most cases is a human who has learned how to magically transform themselves into an animal by wearing the animal's skin. Skinwalkers are typically considered to be evil, and becoming one takes a great deal of sacrifice and a deep knowledge of ancient mystical arts. Real werewolfism is a curse. Those afflicted have little to no control over their actions when in wolf form and little to no control over their transformations. Of course, there is an exception to this rule as well in rare cases of Human Werewolf Syndrome, wherein werewolves in wolf form maintain their human consciousness. This rare condition is believed, though, to only occur in cases where a werewolf child is born to werewolf parents. There are a few different ways to become a werewolf. Becoming a werewolf, though, is a decision that must be thought out well ahead of time, if at all possible. Some methods of becoming a werewolf are more dangerous than others, and life after transformation may not be what you expect. If you haven't yet, please read the heading on Becoming A Werewolf. It will give you all of the information you need to make an educated decision on whether or not lycanthropy is right for you. I suppose it's a bit of a misnomer putting this in "Ways to Become a Werewolf", since if you aren't already born this way you can't do anything about it. Technically, though, it is a valid option, so I guess it stays. In order to be born with the genetic ability to become a werewolf (known formally as "Genetic Lycanthropy"), both parents have to have the werewolf gene to pass on to their child, though neither parent necessarily has to be a werewolf themselves. Those born with genetic lycanthropy are not werewolves right out of the womb. A human with the genetic structure will not begin the werewolf transformation until sometime in late puberty. This can be greatly beneficial to the child, as it has a better chance of survival in society in its human form. Of course, if the human doesn't know they will become a werewolf, this can understandably come as quite a shock. When genetic werewolves begin to transform, they do so in a very similar way to bitten werewolves or cursed werewolves. They begin as more man beast, then over time reach the form of a pure wolf after transformation. A human that was born without genetic lycanthropy isn't yet out of the werewolf game. There are still two other ways to become a werewolf, the most common being through a werewolf bite. Much like vampires, werewolves carry a bacteria in their bodies that is toxic to humans. It is this bacteria that can cause the human body to be capable of werewolf transformation. Unlike vampires, werewolves don't carry a significant amount of this bacteria in their bloodstream. At least not the strains that can infect a human. Werewolves almost exclusively carry the infectious bacteria in their saliva. Thus, when a human is bitten by a werewolf, there is a good chance that the saliva will enter the human's blood stream where the bacteria can do its work. If you are bitten and don't want to become a werewolf, it is best to begin an antibiotic treatment as soon as possible. Success rates are not great with antibiotics, but they are the only known way to possibly kill the bacteria. Following a bite, the bacteria strain will begin duplicating itself immediately in the human bloodstream. The process takes roughly six to nine weeks to fully integrate the human cells. During this time the human may experience insomnia, headaches, and flu-like symptoms, but will not show any external signs of werewolfism. Once the bacteria has fully integrated with the cells, the human will become a werewolf, and as such will experience transformation each night from that point forward. Of the three ways to become a werewolf, the curse is by far the most rare. In fact, we know very little about it other than that it exists. The first werewolf was created by this curse, so we know that the original deity that created the curse has the ability to give it to others. Some later tribal legends suggest that the original werewolf, Matchitehew, was able to bestow this curse onto others, and though it is clear that he did so without biting people, it is not totally clear if he could "cast" the werewolf curse onto them directly. There are myths of black magic spells to transform people into werewolves, but again, the only one I have seen that works with the rest of werewolf mythology is the story of the original curse. good shot and have bullets made of pure silver on hand, then you should have the easiest time of anyone killing a werewolf. A variation on the bullet-to-the-heart method would be finding a way to introduce small pieces of silver shrapnel into the blood stream. This only works if they are able to move through the blood stream and reach the heart. Once at the heart, the smallest bit of silver will cause the heart to immediately stop beating. If the silver lodges itself in the heart, your job is done. Let's say you find yourself in a situation where you want to kill a werewolf, but you don't have any silver bullets on you. In this instance, a regular gun with regular bullets may be able to do the trick. Werewolves are notorious for being able to take a ridiculous amount of abuse. Their muscles are much stronger than ours and their blood clots faster with a wound. They are built to last. Snipers should have a particularly good chance against werewolves. If you can get the drop on one, aim for the head. If you can sever the connection between the spinal cord and the brain, you're going to have an easy time. If not, just make sure that you're in a position that the werewolf cannot reach. Do NOT climb a tree and shoot from there. Werewolves are excellent tree climbers. Sharp objects such as knives, machetes, and even swords are effective against werewolves, but most of the time operating them requires close combat, which leaves a human at a significant disadvantage against a werewolf. Sharp objects at a distance can be effective for example. A bow and arrow, or a spear thrown off a building would work, but you still would likely just anger it, not kill it. If you think I am talking about using a baseball bat to fight a werewolf, you are probably already dead. At best, you might break a rib or two before having your head torn clean off of your body. Chances are you're not going to be in such a lucky position, nor is the werewolf going to stand by while this happens, so alternative ways of combining mass and acceleration are probably necessary. Hitting it with a vehicle. But keep in mind, that werewolves are fast creatures, and quite heavy themselves. Hitting one could seriously damage your vehicle, and missing one could mean that it ends up hitching a free ride in the back. The upside, though, is that you not only have a big metal "suit of armor" surrounding you, but being inside a vehicle also makes escape much, much easier. The area that became Wisconsin was home to the original tribe that can claim that former tribe members were the first to have the ability to transform into wolves. The legends of the Wisconsin Werewolves go back as far as the original history of the werewolf. Between 1936 and 1999 there were several sightings of a creature that terrified the local population. Mark Schackelman was driving along Highway 18 when he noticed someone digging in a field off the side of the road. The site was a location where a Native American burial ground was believed to be. When Schackelman slowed down to get a better look, the "man" turned around and faced him. It turns out that it was a hairy creature that stood on two legs, which he described him as looking like a mix between an ape and a dog. The creature had the general shape of a large man, with opposable thumbs and everything. He then drove off in a hurry but remained curious about the creature. The next night he drove past the same area hoping to see the creature again. He couldn’t believe his eyes when he did. This time the man-beast growled at him in a way that sounded eerily human, making a sound that he described as "ga-DA-ra". Schackelman freaked out and the creature ran off. Dennis Fewless was driving along Highway 89 around midnight when he saw a figure running across the road. When his headlights caught sight of the creature, it was eerily similar to werewolf seen in 1936, just a couple of miles away. Large and muscular, stood around seven feet tall, covered in dark brown hair, with a dog-like face. Dennis claimed that he saw the creature run across the road, jump over a barbed-wire fence, and disappear into a corn field. He then waited until the sun was up the next day to return to the scene of the werewolf sighting. He had hoped to find tracks to prove the size of the beast, but the ground was too hard. He was able to find the place in the cornfield where the werewolf had entered. The stalks of corn were broken and askew in such a way that supported the theory that something or someone of a large size had been there. An undisclosed woman called 911 when she heard someone trying to break into her rural home in the middle of the night. Upon further investigation, it appeared that it was not a person, but a large animal that had tried to get in. A few weeks later the creature returned and again tried to forcefully enter the house. This time the woman saw the creature. She described it as around eight feet tall, covered in dark brown hair, and it stood on two legs. It had long arms with hands that had long, sharp claws on them. When the creature couldn't get inside the house, it went out to the woman's barn and attacked a horse. The horse was alive, but had a deep cut across its back. The Wisconsin Department of Natural Resources investigated, finding a foot print that was said to be over a foot long. The town of Elkhorn, about an hour south of Jefferson County, had its own reports of the Wisconsin Werewolf. The first sighting occurred in 1989, though it wasn't reported until another sighting was reported 10 years later. A woman named Lorianne Endrizzi had seen a large figure on the side of the road. As she got close she realized that it was not a person but a tall beast, covered in gray/brown hair, with a dog-like face featuring fangs, pointed ears, and glowing yellow eyes. A dairy farmer named Scott Bray owned a cattle pasture near his family's namesake street, Bray Road. He reported seeing a dog, larger and taller than a German Shepherd, in his pasture one night. The creature was muscular and heavy, covered in gray/brown hair with pointed ears. Bray was able to find footprints, larger than any known dog or wolf, in the pasture the next day. Russell Gest saw a large, dog-like creature in Elkhorn close to the time of the previous two reported encounters. He described the creature in a very similar way to the other reports, stating that it stood on its hind legs and began to slowly approach him before he ran away. An 11-year old girl named Heather Bowey saw what she thought was a large dog stand up on its hind legs and run away. She lived near Bray Road, which would become part of the famous nickname for this werewolf. Tammy Bray, the wife of Scott Bray, was driving back to her home on Bray Road when she saw the creature. She also described a tall, broad shouldered, and muscular beast covered in dark brown hair. The dog-like face and glowing yellow eyes match the previous descriptions of the Wisconsin werewolf, though at this point, the other sightings had still not been widely reported. This is the sighting that got everyone talking. It was the night of Halloween 1999, and an 18-year old woman named Doristine Gipson was driving along Bray Road, when her car suddenly jerked as if she had hit something. She got out of the car and walked back along the road, straining to see. Then she caught sight of what she had hit. A huge, dark, hairy figure began rushing toward her. Gipson ran back into her car and began to drive away. The beast reportedly jumped up onto the trunk of the car, but due to the wetness of the rain-covered car, it could not hold on and fell to the ground. Gipson said she drove back to the location that same night with a young trick-or-treater, and they both saw a large figure laying on the side of the road. They didn't stay long. Gipson reported the sighting the next day, which is what brought the other witnesses to share their tales. At this point, no one was sure what the creature was, so they dubbed it "The Bray Road Beast". 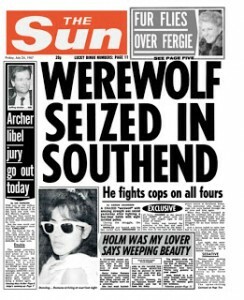 My tale today concerns an alleged case of Lycanthropy which occurred during the 1980`s in the seaside resort of Southend on Sea when a mild mannered carpenter called Bill Ramsey became known in the press as the `Werewolf of Southend`. Bill had been suffering since he was 9 years old with bouts of weird behaviour that people described as being wolf or animal like and accompanied allegedly by a foul smell. On the first occasion Bill became possessed with this condition he was able to rip out a post from concrete and smash it to pieces in front of his parents. From then the attacks were mild until Bill in adult life realised he was losing self-control and voluntarily attended hospital where another major attack occurred and he bit a nurse and ransacked the hospital before being sedated. It was clear that Bill had lost self- control of his condition and on the night of 22nd July, 1987, the now 44 year old decided to visit Southend Police Station and asked to be locked up for his own and the public's safety. During the course of a conversation with a police officer, Bill suddenly became enraged and `wolf-like` and physically attacked the 6` tall, 14 stone (196 lb or 89 kg) officer by hurling the him across a car park and in the course of restraining Bill, it took no less than six police officers to bring him under control and then finally taken away to be secured in a police detention cell. Bill`s enraged `werewolf like` behaviour did not cease under lock and key, as at one point Bill was able to wedge his head and arm through a cell door inspection hatch and whilst still snarling and snapping at officers. Police then were forced to call a doctor who administered Bill with a powerful sedative whilst the fire brigade were able to free him from the hatchway. Bill`s case went global, and in the USA, Ed and Lorraine Warren the well-known demonologists flew over to Southend to investigate his case. Suffice to say Bill was later taken to America and his condition was proscribed as `demonic` and later exorcised in a church ceremony in the USA. To date Bill has not suffered with any more bouts. Was Bill possessed? Or was Bill suffering from a rare mental condition known as Lycanthropy where the term is used in medical circles as reference to a mental illness in which a patient believes he or she is, or has transformed into an animal and behaves accordingly. This is sometimes referred to as `Clinical Lycanthropy` to distinguish it from its use in legends. Whatever the truth is, the story makes compelling reading, and here is a video made concerning the event.